Brave Elizabeth is a biog­ra­phy of Eliz­a­beth Jack­son, the mother of Pres­i­dent Andrew Jack­son. I believe that envi­ron­ment and hered­ity influ­ence a per­son, and it was fas­ci­nat­ing to me to research the mother of one of our Pres­i­dents. Here is a snip­pet of her life. Andrew and Eliz­a­beth Jack­son were liv­ing in Boney­be­fore, Ire­land, in 1764. They were ten­ant farm­ers and not mak­ing enough money from their crops and sheep to make ends meet. Taxes con­tin­ued to go up, and the weather con­tin­ued to cast blights on their har­vests. The Scots-Irish cou­ple worked hard, but life under the British rule was a hard-scrabble exis­tence. Dis­re­spect and prej­u­dice for their Pres­by­ter­ian reli­gion was also challenging. A new life in a new land cap­tured their thoughts. In April 1765, Andrew and Eliz­a­beth Jack­son crossed the Atlantic Ocean to the colonies with their two chil­dren. Hugh was two, and Robert only a babe. The eight week voy­age from Larne, Ire­land, was uneventful. They bought land close to Elizabeth’s fam­ily and erected a small one-room cabin. They planted crops and started over. Hap­pily for two years, the Jack­sons worked hard and strug­gled to eke out a liv­ing in this red clay, but in March 1767, while chop­ping wood on a cold, spring day, Andrew Jack­son had an acci­dent and died shortly there­after. Eliz­a­beth, nine months preg­nant with their third son, was a widow at thirty with all the respon­si­bil­i­ties of a sin­gle mother in eighteenth-century America. Though small in stature, Eliz­a­beth was strong and resilient in spirit. She adapted to life’s changes and dis­ap­point­ments and put oth­ers’ needs before her­self. Work­ing hard and push­ing for­ward through chal­lenges was the model she set for her sons. After Andrew’s death, her sis­ter and brother-in-law, Jane and James Craw­ford, asked Eliz­a­beth to move in with their fam­ily. Jane had been sick for sev­eral years and needed help with the house­keep­ing. Their eight chil­dren needed more super­vi­sion than she could give, so the Jack­sons joined the Craw­ford household. Busy with the daily chores of plan­ning and prepar­ing meals for four­teen indi­vid­u­als in a fire­place, tend­ing to the needs of eleven chil­dren and her ail­ing sis­ter, mend­ing, spin­ning, man­ag­ing a gar­den, churn­ing, etc., Eliz­a­beth con­tin­ued to weave cloth for the com­mu­nity. She earned money from the neigh­bors by sell­ing the cloth and was known for the qual­ity and exper­tise of her work. Eliz­a­beth wanted her sons to have a for­mal edu­ca­tion. All three boys attended the church and com­mu­nity schools, but Hugh and Robert had more apti­tude for out­door activ­i­ties, and they wanted to farm. Andy learned to read at an early age, and his mother thought he might become a min­is­ter. His per­son­al­ity was not for a scholar’s life though, and the Rev­o­lu­tion­ary War inter­rupted his education. Elizabeth’s faith in God and His Prov­i­dence was a major ingre­di­ent in her char­ac­ter. She had a small Bible that she car­ried in her pocket, and she prayed often. She taught her sons the impor­tance of obe­di­ence to the Bible’s teach­ings and encour­aged them in their loy­alty to each other and the rest of their fam­ily. 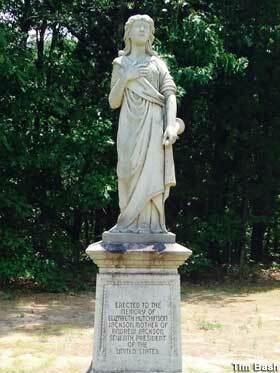 Eliz­a­beth urged deeds and words hon­or­ing God, fam­ily, and country. The Wax­haws set­tle­ment was con­nected to Charleston via the Catawba Path, also known as the Cam­den Sal­is­bury Road, with many trav­el­ers. Mer­chants and Indian traders car­ried their wares to mar­kets. Farm­ers drove their cat­tle to sale. New set­tlers in the Con­estoga wag­ons or on foot were daily vis­i­tors. All of these trav­el­ers kept trade, cul­ture, and news flow­ing into the upcoun­try where the Jack­son fam­ily lived. Because of the prox­im­ity of the Craw­ford home, vis­i­tors kept them in the know with infor­ma­tion and intelligence. On 20 June 1779, sixteen-year-old Hugh died after the Bat­tle of Stono Ferry near Charlestown. The two-hour bat­tle was not a win for the Patri­ots, but the mili­tia fought bravely. Hugh was not wounded but died of heat exhaustion. Eliz­a­beth nursed the dying and wounded after the horrific Bat­tle of Wax­haws. She didn’t shy away from either the pain or wounds of the soldiers that were slaughtered by the British at this battle. Later, she hid with her fam­ily from the British, who stole and burned the patri­ots’ farms. Robert and Andy were under the com­mand of the expe­ri­enced Major William Richard­son Davie. Because of his youth, only thir­teen, Andy served as a mes­sen­ger. Guer­rilla war­fare and destruc­tion was the aim of both sides, and enemy neigh­bors paid back old insults. Then in the spring of 1781 both Robert and Andy were cap­tured by the British, along with oth­ers in the Wax­haws mili­tia. They were taken to the Cam­den Jail. Small­pox was in every cell, and before long both boys were afflicted. Eliz­a­beth Jack­son was deter­mined to res­cue her sons from this hell­hole. She auda­ciously went to see Lord Raw­don and asked for him to add her sons’ names to a pris­oner exchange that was in the works. He was not unhappy to release two sick prisoners. Their mother nursed them for sev­eral weeks, but Robert was too weak and died. She never left Andy’s side until he could walk by himself. Hor­rific tales about how the Patri­ots were being treated on the British prison ships in the har­bor of Charlestown began to cir­cu­late. Eliz­a­beth found out that sev­eral of her nephews were on those ships suf­fer­ing with cholera. Know­ing their chances to sur­vive were small with­out some kind of nurs­ing, Eliz­a­beth and a cou­ple of women from the Wax­haws com­mu­nity decided they needed to go help the young men. In the fall of 1781, three women left home on a mis­sion of mercy. Elizabeth’s nephews sur­vived, but she did not. She caught cholera and was buried in an unmarked grave in Charleston. Eliz­a­beth taught her sons the dif­fer­ence between right and wrong, and free­dom and oppres­sion; the impor­tance of help­ing fam­ily and friends; rev­er­ence for truth, jus­tice, and free­dom; and a deep patri­otic devo­tion to coun­try. 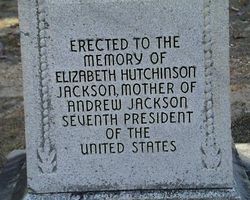 Eliz­a­beth Hutchin­son Jack­son was a Patriot, a South Car­olina Rev­o­lu­tion­ary War Hero­ine, and the mother of Pres­i­dent Andrew Jack­son. Her story is worth remembering. Posted in Uncategorized and tagged Battle of Stono Ferry, Battle of Waxhaws, Camden Gaol, Camden-Salisbury Road, Charleston, Elizabeth Jackson, President Andrew Jackson, Revvolutionary War, SC history, SC Revolutionary War heroines, Scots-Irish Presbyterians, Waxhaws. Bookmark the permalink.